It has the exact same typesetting as the regular sized Quentel (which will be back in stock in late 2019) except it is substantially thinner. In fact, it is 50% thinner than the 1st Edition Quentel NASB. (It is exactly the same thickness as the current Personal Size Quentel NASB.) Pictures here. 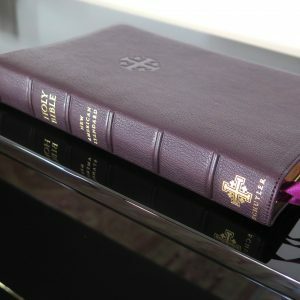 More than 95,000 entry cross references and about 17,000 translation footnotes, Presentation page, Lined Note Paper, and Schuyler Bible Maps. Here is the personal size version of the NASB Quentel. More NASB Quentels due late summer/early fall. They will be available in Black, Slate, Antique Marble Brown, Imperial Blue, Firebrick Red, Dark Green, and Tan/Blue.